I was a little nervous as I was nearing this episode. 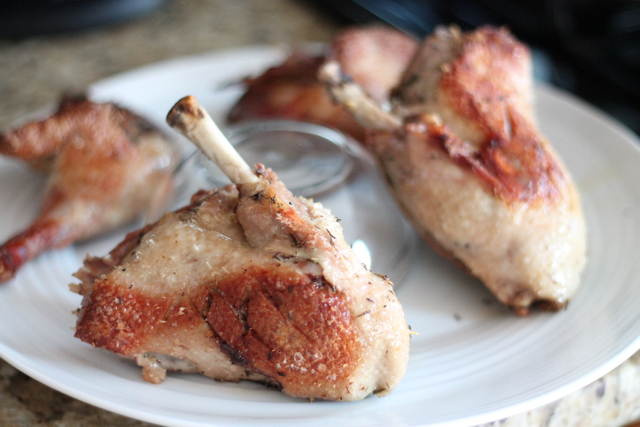 I’ve never made duck before and have only consumed it a handful of times. Not only did I have to cook it, I had to quarter it. Lucky for me, I just had my knives sharpened. 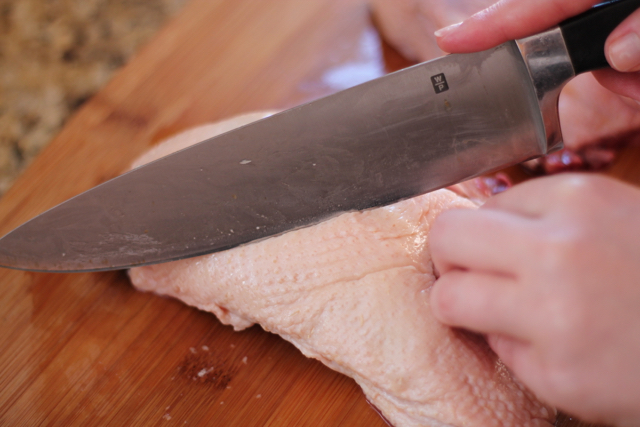 A word to the wise, don’t attempt to butcher any type of meat without a nice, properly sharpened knife. I’ll take you step by step through the process. 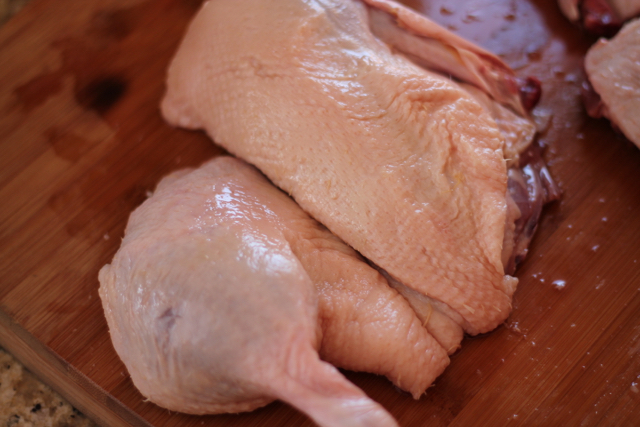 Get your thawed duck on the board. Take out anything you may find in the caboose ie. 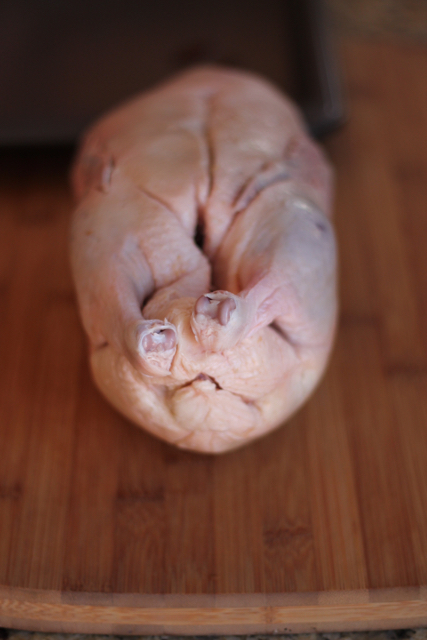 heart, gizzard, liver, packet of sauce (I don’t recommend sauce found inside ducks). Next take off the wings. Slice through and bend it back. 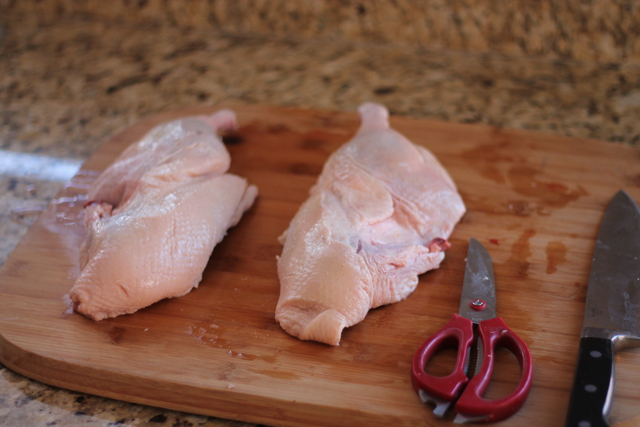 Freeze these for later. Flip it over, and to the same thing down the other side. Take the spine and freeze that with the wings. It’ll make a great stock. Flip it over. 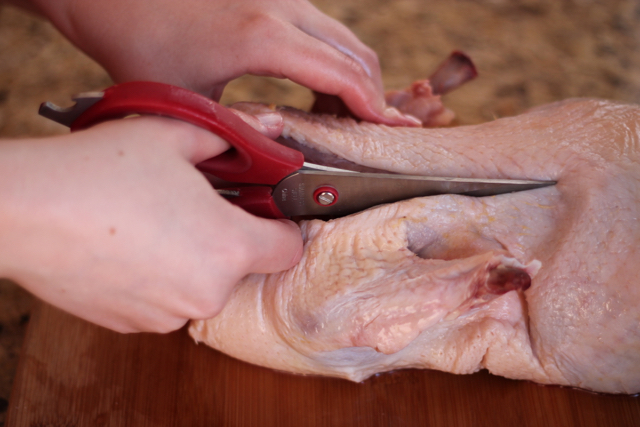 With your shears, cut right down the center of the breast. 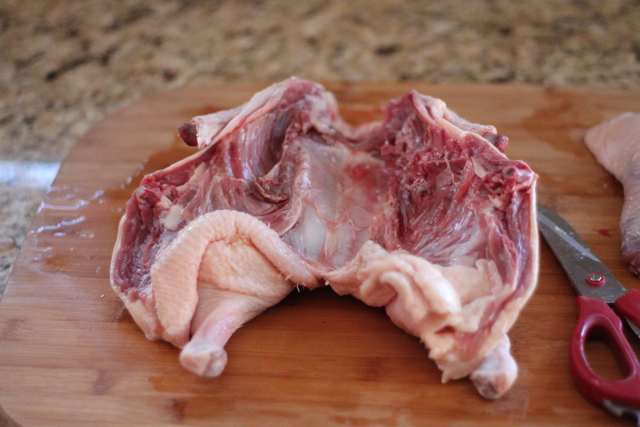 Because the breast has a lot of subcutaneous fat, we want to give it some exit points. You want to cut into the skin, but not down to the meat. Gently score 3 cuts one way, and 3 going to the other way crossing each other, kind of like tic-tac-toe. 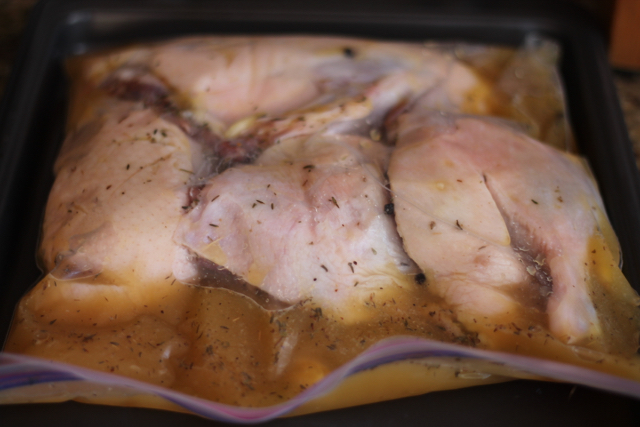 I made a brine just before this with orange juice, pineapple juice, salt, peppercorns, thyme, and smashed garlic. I put it in a Tupperware container and shook it up until the salt dissolved. 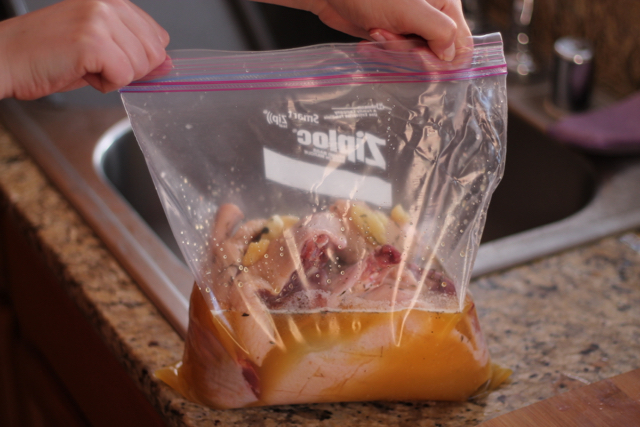 Put the quartered duck into a zip top bag and add in the brine. Refrigerate for 2-3 hours. 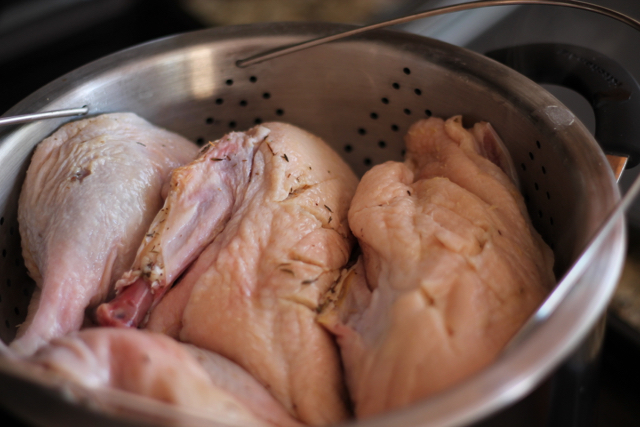 Once the duck has brined, bring 1″-2″ of water to boil in a large pot. Place the duck in a steamer basket. Be sure to not stacked pieces on top of one another. 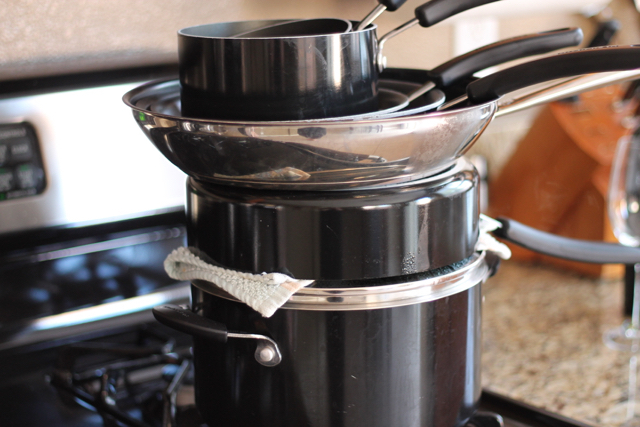 Put the lid on the pot and weight it down to prevent it from lifting off. I may have over done it a little. Steam for 45 minutes. While steaming is going on, preheat oven to 475 with a cast iron skillet inside. You want the skillet to be NASA hot! 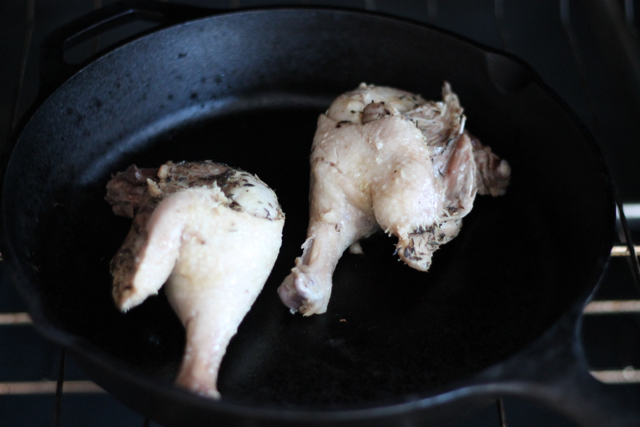 Once steaming has finished add the leg quarters to the skillet skin side down. Put in the oven for 10 minutes. After 10 minutes, add breasts to pan for an additional 7 minutes. This is going to make the skin nice and crispy. 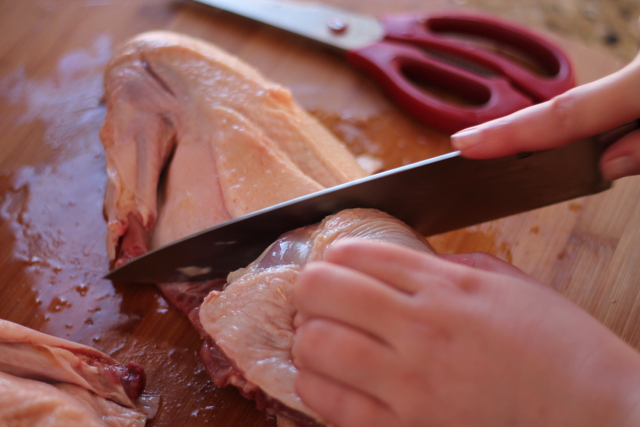 Once they’ve finished in the oven, put the duck pieces on a plate with a small bowl in the middle. 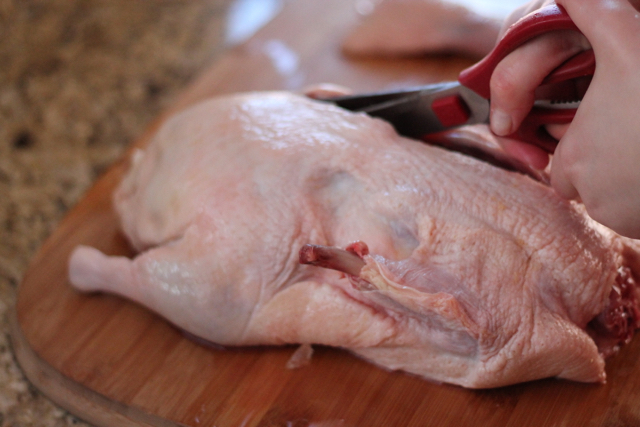 This will keep the duck at the edge of the plate and prevent it from sitting in its own juices. Cover with foil while we work on the chard. Grab your skillet, it will be hot! No heat will be required here as the skillet will retain plenty for our veggies. 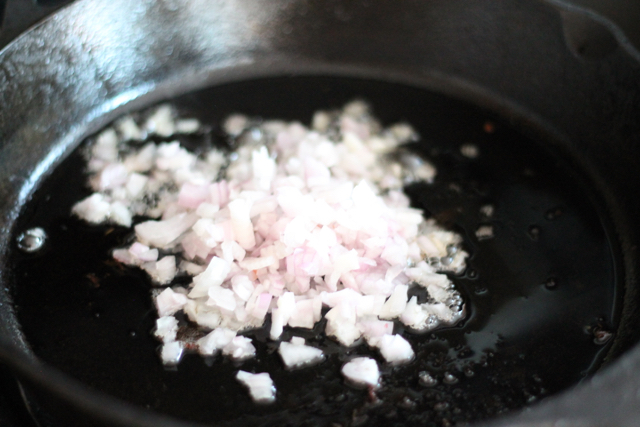 Add in shallots to that delicious leftover duck fat. Then add in chard and let it wilt down. Add in a little balsamic and you’re done! If you want to get the most out of your duck fat, do this. From the steam water that was left over, turn heat on high. Let water evaporate down until the all that remains is the duck fat. 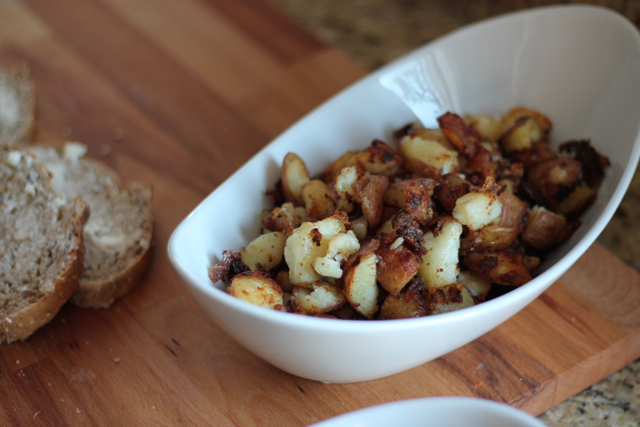 Cube some red potatoes, simmer them in a separate pot of salted water for 10 minutes. Drain and saute in the rendered duck fat until potatoes are nice and crispy. There are no words! This meal was so decadent. Duck fat (a.k.a liquid gold) in every bite of the meal. I was really surprised how delicious the duck was. It was cooked through perfectly and had a great crispy skin. 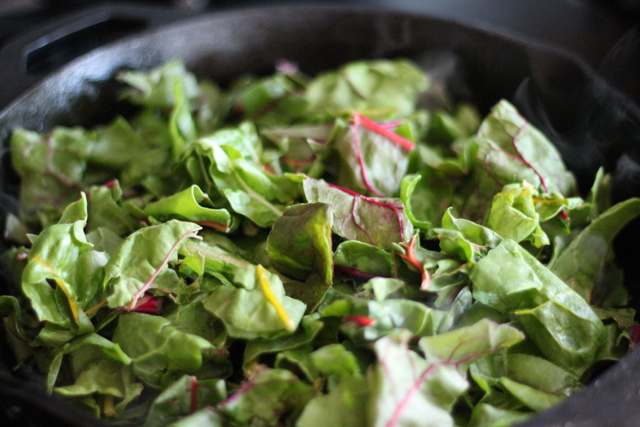 The Chard had a fresh and bright taste despite being cooked in duck fat. The potatoes were OUT OF THIS WORLD GOOD! Verdit=GOOOOOOOD EATS! Definitely give this a try. Thanks 🙂 It was so good!